He had picked from a drawer a little tarnished cylinder, and. undoing the tape, he handed me a short note scrawled upon a half-sheet of slate-gray paper. “You look a little bewildered,” said he. “It was a prosaic way of forming a friendship, but it was effective. I was laid by the heels for ten days, and Trevor used to come in to inquire after me. At first it was only a minute’s chat but soon his visits lengthened, and before the end of the term we were close friends. He was a hearty, full-blooded fellow, full of spirits and energy, the very opposite to me in most respects, but we had some subjects in common, and it was a bond of union when I found that he was as friendless as I. Finally he invited me down to his father’s place at Donnithorpe, in Norfolk, and I accepted his hospitality for a month of the long vacation. “Old Trevor was evidently a man of some wealth and consideration, a J. P., and a landed proprietor. Donnithorpe is a little hamlet just to the north of Langmere, in the country of the Broads. The house was an old-fashioned, widespread, oak-beamed brick building, with a fine lime-lined avenue leading up to it. There was excellent wild-duck shooting in the fens, remarkably good fishing, a small but select library, taken over, as I understood, from a former occupant, and a tolerable cook, so that he would be a fastidious man who could not put in a pleasant month there. “Trevor senior was a widower, and my friend his only son. “There had been a daughter, I heard, but she had died of diphtheria while on a visit to Birmingham. The father interested me extremely. He was a man of little culture, but with a considerable amount of rude strength, both physically and mentally. He knew hardly any books, but he had travelled far, had seen much of the world, and had remembered all that he had learned. In person he was a thick-set, burly man with a shock of grizzled hair, a brown, weather-beaten face, and blue eyes which were keen to the verge of fierceness. Yet he had a reputation for kindness and charity on the countryside, and was noted for the leniency of his sentences from the bench. 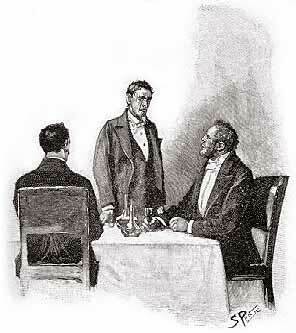 “One evening, shortly after my arrival, we were sitting over a glass of port after dinner, when young Trevor began to talk about those habits of observation and inference which I had already formed into a system, although I had not yet appreciated the part which they were to play in my life. The old man evidently thought that his son was exaggerating in his description of one or two trivial feats which I had performed. “The laugh faded from his lips, and he stared at me in great surprise. ” ‘Anything else?’ he asked, smiling. “Mr. Trevor stood slowly up, fixed his large blue eyes upon me with a strange wild stare, and then pitched forward, with his face among the nutshells which strewed the cloth, in a dead faint. “You can imagine, Watson, how shocked both his son and I were. His attack did not last long, however,- for when we undid his collar and sprinkled the water from one of the finger-glasses over his face, he gave a gasp or two and sat up. “And that recommendation, with the exaggerated estimate of my ability with which he prefaced it, was, if you will believe me, Watson, the very first thing which ever made me feel that a profession might be made out of what had up to that time been the merest hobby. At the moment, however, I was too much concerned at the sudden illness of my host to think of anything else.